Sweet Scarlet is ALL about Christmas. If you’ve attended one of our Christmas concerts, watched our recently released Christmas EPK, and/or have even met us, you’d know this as fact. 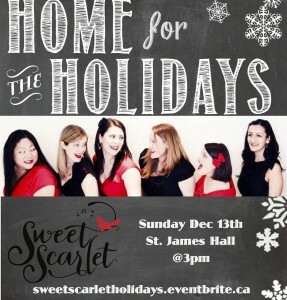 We eat, sleep and breath Christmas and we cannot wait to share our self-presented show on December, 13th, 3pm, at St. James Hall, with you! We, like you, get the warm fuzzies about this time of year. The Christmas season is all about traditions, new and old, that brings you close to the people you love (cue the Christmas music!). Our Christmas shows are fun and filled with holiday spirit and your favourite carols with the twist of intricate harmonies and SPARKLES (okay, not actual glitter, but you know what I’m talking about!)! This year, our show, Home for the Holidays, is overflowing with the jing-jings of jinglebells, and chockablock full of lyrical joy and happiness. We hope that you have, or will, make our Christmas concert one of your annual holiday traditions! Get your tickets here. SPOILER ALERT!!! Here’s a feature of a new song in our repertoire that is sure to make you get in the spirit! It was in the heat of summer when we sat down for one of our famous Christmas-Music Listening Parties, which at the time was not at all seasonally appropriate! Who thinks of and sings Christmas songs in a dead of summer heat wave? *six sassy thumbs indicate* WE DO!!! It was June’s turn this time that brought us this gem. It was an instant YES on our Yes/No/Maybe chart. A Christmas themed, PTX original, with beautiful harmonies and touching lyrics about the little things that make them feel nostalgic? YES PLEASE!!! It’s a snuggled-by-the-fireplace-with-hot-coco kind of song; the kind that fills you with warmth from the inside and out. So there you have it, cat’s right out of the bag, you can expect to see this song at our show. It’s sure to be a new favourite of yours! Click on the link below to watch a quick candid clip of us singing “That’s Christmas to Me” in rehearsal.